Where Are You Buying Your Vegetable Garden Seeds? You might ask (or be wondering), “Where is the best place to buy seeds for the garden?” Maybe it doesn’t matter much, but then again maybe it does. Do you care to share your preferred supplier or retailer where you buy your seeds? Spring is coming and hopefully you’re beginning to plan this year’s vegetable garden, or maybe you have already started some seeds indoors. Did you (or are you) simply going to visit a local retailer to buy your seed packets or are you going to order them online? Or are you going to wait until planting time to buy ‘starter’ plants? I realize that most people don’t do that, but it’s a thought to consider as you move forward with your gardening. The main thing though is to actually get a garden in the ground! Okay, lets hear from you! I have used Rareseeds.com for heirloom seed purchases. I have mostly bought from a local / sort of local person who comes to the “seed savers” event each year (thinking of which it is getting on time to keep an eye out for same). She / her husband, have an organic farm. They save a lot of their own seeds, as well as any purchased are carefully researched, etc.. Have had good luck with the few I purchased. Familyfirstsupply.com and patriotsuppply.com heirloom seeds that are not GMO!! I use Preparedness Seeds from Emergency Essentials. They are NON-GMO, NON-Hybrid seeds Packaged for long term storage. I get seed from a variety of places. Southern Exposure Seed Exchange, Territorial Seed, Henry Fields and a few others. It usually depends on what I am going to try to plant. Living in the Southeast now, originally from Midwest and trying to learn how to garden down here and what does best. I usually still buy heirloom seeds. Does anyone know if you can plant parsnips in a container? I’ve done carrots in a pot before but never tried parsnips. Can’t garden in ground at this house. Can not wait to move in Spring of 2017. I’m trying to buy seed from companies that have not been bought up by big chem ag corps. I buy my seeds from T&T Seeds in Winnipeg Man. They have lots of heritage seeds & all there fruit trees are for Zones 2 & 3 which is ideal for our area. I also save some of my own seeds. I’d like to do more of that but as I get older I slow down & some things get put off. A couple years ago I tried saving carrot seeds. Got as far as carrots in bloom but canning & freezing got in the way of making net bags to put over the blooms to save the seeds but not all was lost as next spring had a nice patch of volunteer carrots. I think before winter is over I will have to make the bags so they are ready. I grow all of your top 10 & all of your top calorie ones except yams which of course take a much longer season than we have. Winter squash & parsnips have to be my substitute for them. I had been buying most local that were listed as non GMO and heirloom and ordering special select varieties online from small businesses. But did not have as much time last year for a full garden since we were starting the heavy lifting on our new acreage. This year, the garden and trees are a main focus. I will use the seed vault that I purchased from My Patriot Suppy a few years back and see how it stacks up. Also have multiple bare root trees coming. Trying a method I tested last year hat gave excellent results. If anyone has used the seeds from “My Patriot Supply” (a bunch of sealed packets inside a can), let us know how they germinated and worked out for you. I am especially curious to discover success rates from their can of seeds if they’ve been sitting around for a year or two… (I happen to have a few cans that are a few years old and don’t know how they’ll fare if I commit the time to them at this point). I do know that seeds are ‘alive’ and they will not stay alive forever… from what I gather – a few years may be about it in general – depending on storage conditions (cool and dry). Cool and dry, yes. I have mostly gotten rid of the oldest seeds, but I had some watermelon seeds that were well over 15 years old (I think about 25, but I’m not sure) so I decided to try it and thought maybe one or two might come up out of the 30 +. They ALL came up. Melons and squashes seem to last the longest in this regard. Usually I assume 2 to 5 years beyond what the “experts” say and they still seem to have a high germination rate. The smaller the seed the shorter the viability, for the most part. There are exceptions, of course. I’m also interested in anyone’s experience with the My Patriot Supply seeds. I’ve bought several of their seed vaults and a couple of the Salsa Garden cans that I’ve yet to open and plant. The older seed vaults are only a couple of years old, and will be gifted out this Christmas as part of my seed rotation. About seeds not lasting forever, I have kept seeds in my freezer for years. I found a package of squash seed that I had overlooked. It was dated and was 15 years old. I planted it and all came up and made wonderfully. The world seed vault is in Iceland in a frozen mountain. Freezing seed keeps them for years. Correction it’s not in Iceland. Actually it’s in Norway, specifically Norwegian island of Spitsbergen near Longyearbyen. Google Svalbard Global Seed Vault. Another question: Will seeds survive if vacuum sealed? I have a patriot can from 2013, kept in refridg in a plastic freezer bag. I plan on using some this yr to see how they do. Rareseeds.com has the best prices and an awesome selection of heirloom seeds. I also practice seed saving, so it’s important to start off with good heirloom seeds and go from there. I harvest my own seeds, so unless I decide to try out a new variety (like the luffas I’m trying for the third year running) I don’t buy them. I know what I’ve got and I don’t need to worry about GMO contamination because for the most part I’ve been saving these same seeds for upwards of 10 years. I do luffas every year and get an overload every year. 1 luffa gets 100’s of seeds!! If you need seeds let me know somehow and I can send them. Vines grow everywhere and get huge yellow flowers!! I still have seeds. The problem isn’t the seeds, it’s the transplanting. They don’t survive transplant. I did several last year in different situations and none survived. This year I have a big cardboard box that I’ve lined with plastic. I’ll plant then in there and just move the whole thing outside when it’s warm enough. No transplant. how about trying this? I swear every year that I will, and have not got to it. Maybe this year. Plant your seeds directly in ground, well before usual.. Cover with newspaper/cardboard etc, stuff that can degrade, and maybe it will come up. In fact, before doing that, cover the bed with a heavy plastic or such for couple weeks to warm up soil some. Then plant, cover with biodegradables, papers/ leaves etc. Maybe it would work. Many yrs ago, my Dad, in a very snowbound, cold climate, started planting most of his garden seeds in fall, and covering thoroughly with whatever he had. Result was bumper crops. Swear, I am going to try it this year. Makes sense to me that your dad’s system would work well. I am going to give it a try, too. Thanks for the info. me too, am going to try. gotta get out and put some “stuff” on it, and pick up a few seeds. I buy from Baker creek/rareseeds. We have used them for some years and have had good results. Last year we had a few potatoes left in the spring, looked like hell but I planted the anyway, came up a little slower but produced as well as the others. I like Rareseeds.com, they literally have thousands of verities of quality seeds, all Heirloom. I’m getting a new order in this year as I did not get my expected “salvage” of seeds I was expecting, My fault, got lazy after fall harvest. We usually just get ours from the local grange. I built a backyard garden for a client last year with a similar raised-bed design. I used rough-cut 2×10 Cedar. There was one solid row built at the north end of the property line approximately 40 feet long. Inside the main yard area, I built 6x raised beds at 3ft Height x 10ft Length x 4ft Width. Left enough room between boxes to run a wheel barrow. Prior to building boxes, I trenched and landed water line for a multi-zone drip system. Turned out really nice (I was envious). Also ran electrical conduit and an additional water supply line to a 20ft x 10ft pad on the north-west corner of the property for a future greenhouse. As you get older, it helps to tend your garden without having to bend over! The panels are Simons Concrete Panels for forming concrete walls, they are 2’X4’ laid on side, the corners have a slotted angle iron with a “pin” to hold them together the long side has a 4’ long “snap tie” to hold it together side to side. I laid a good heavy landscape fabric under (you can see it sticking out) and filled the first 16” with “junk” dirt, than the top 8” with really good quality gardening soil/compost/manure/…. Being two feet high it helps with the critter control (rabbits, goffers, moles) and the like, I have 2”x2” mesh I lay on top to keep the birds off the new seedlings and a few homemade “domes” for early planting and late fall crops to protect from the frost/freeze. The milk creates are GREAT for cabbages, again I just line with landscape fabric and fill, Everything I do I keep above ground, a LOT easier on the old back when working, also I have very very few weeds, being raised beds. And honestly those 4 beds produce more produce than 2-3 people can eat/can in a season. And I’m increasing by 50% (two more beds) this year??? HAHAHA yes I am NUTS, but I do LOVE gardening and the free-ish food. Yes I do give a LOT away to neighbors and friends. An Crazy Old Fart has to have his hobbies, right? I like the concept. The less bending over, the better on the knees and the back! If not purchased locally, I use Gurney’s Seed & Nursery or Burpee. Going to try melons again this year. Tomatoes, herbs, lettuce, kale, and beans as usual. Cherry and apple trees will be blooming soon. Also have a 30 ft. span of grape vines that produce very well. The dwarf Meyer lemon tree has produced 50+ lemons every winter. They are extremely juicy, have a thin rind, and are packed with vitamins. Highly recommend one or two if you haven’t tried them. Forgot to mention: don’t forget to disinfect your sprouting seeds! Pam, a 10 minute soak in an aqueous solution of 6% H2O2 (hydrogen peroxide) or 2000 micrograms/ml NaCIO (sodium hypochlorite) has been documented as a safe method to disinfect sprouting seeds for salmonella. The sprouting success rate can go down though. I’ll link a brief article below if Ken will allow, so long as it isn’t a conflict of interest (it’s on a distributors website). The recommendation from their supplier is a 5 minute soak in a 3% H2O2 solution, heated to 140 deg. F. If you want scientific documentation, you can search for terms such as “disinfection of salmonella for sprouting seeds”. Thanks Tex! Your response is greatly appreciated! Seed Savers Exchange is great. Really good variety, great prices and helpful advice. In the past few years I have gotten most of my seeds from Northern Gardens, a garden supply store about 65 miles away and a few from a local hardware store. I saved some cucumber and pea seeds from last year’s crop, and I have some partial packages of carrots, radish, turnip, etc. left also. But this year I am expanding my garden and, planting a few seeds inside. The garden supply company in Cody doesn’t open for about 5 weeks and there is not much in the hardware store yet. I ordered a bunch of catalogues last year and bought some raised beds and grow tubs, melon cradles, trellis netting, etc from Gardens Alive, Park Seed, Burpee, and Gardners.com. So I bought some seeds from some of them, too. I also bought a few seeds from Henry Field. Their prices are generally lowest, and they had a special of 15% off. Gardens Alive had a special of $25 off plus free shipping. No minimum order. I think they extended the deadline; it might still be available. I got the last of my orders in yesterday. But the ground is still somewhat frozen, and though most of the snow has melted, it is still pretty wet. Also, I will need some peat moss or potting soil to supplement my compost. The hardware hasn’t stocked it yet so I haven’t started building my garden yet. In years past I used pre sprouted plants in my garden, but in the last few years decided to grow plants from seed my self. I only bought seeds that I liked but now have added other variety of seeds for survival purpose. I started to purchase heirlooms seeds after reading this blog how there seeds can be harvested for future use. What I have done is added seeds that are hard to cultivate so I can have when SHTF. New to this but find it worth the time and effort. I buy seeds at the end of season at 1/2 price so I can have more in my inventory. I buy from rareseeds/baker Creek but find if I save seeds after 3 years they are acclimated to my environment. They become stronger and grow beautifully every year. I buy my cruciferous type seeds locally, cabbage, broccoli, & cauliflower . I wish I had the room to save the seeds from these plants. I raise my own “starter” plants. I will probably plant Rattlesnake pole beans, Roma II bush beans, Amana Orange & Brandywine tomato plants, Cushaw squash, yellow zucchini, straight 8 cucumbers, & Peaches & Cream sweet corn. A little mix and match. I walk a borderline between open pollinated and hybrid seed. Right now, we can a lot of food, so I’m working on production. Love Southern Exposure Seed Exchange. I’ve used them for several years and successfully saved and grown there seeds. They even give a discount using your account code that’s found on your catalog. I buy a lot of seed at the local co-op that are heirloom. Then for special kinds I buy from Seed Savers Exchange and Rare Seeds. If you like okra, try the cowhorn variety at Rare seeds. It gets to a foot long and still tender. Love my fried okra. Also freeze any left over seeds for next year they keep for years. I actually buy seed ahead of time and freeze so if things happen I will have seeds for the future. We have seeds from last years harvest, some seeds bought from the local hardware store and some seeds from Emergency Essentials. Where I live I buy locally and one of the reasons is when buying “Survival Vault seed packs” I get a lot of seeds that don’t do well in my climate. Over the years I have had good luck with “Ed Hume and Burpee” seeds. They have heirloom seeds and I can buy what grows here. I do a lot of canning and have several books on canning and growing plus I have a large 3 ring binder of favorite canning recipes. My goal this year is to grow and can enough for one year supply. just my thoughts on the garden boxes up above, in case any re rushing out to make same..
wouldn’t work for me. Would need it half that wide. We did ours three feet wide because the back set is against a block wall. Four feet wouldn’t be too bad, but sometimes you have to be able to reach all the way across and with the boxes four feet wide you can’t do that as easily. I’ll probably be rebuilding the boxes this spring or summer. They’re 18 inches off the ground (we have gophers) and 18 inches deep. The base is covered with pond liner to keep supports and the under-layer from rotting, but the side boards have warped badly. You may want to supplement your seed stash with the non- heirloom varieties as the many of the heirlooms are not disease resistant. I would rather eat GMO than not eat. one caution with hybrid and GMO seeds, they are cytoplasmic male sterile. This can get into your heirlooms and male sterility passes down through the female line. Even if you get seeds on a plant, the mom can pass it forward. 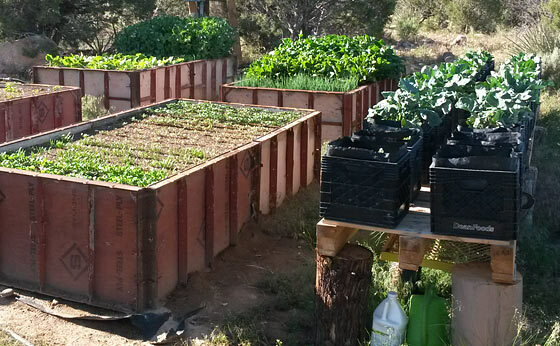 We have 3 veggie gardens, an herb garden, and a greenhouse, plus a small orchard. We also grow perennial foods scattered around the property, including fruit trees and vines along the woods’ edge. We also have an asparagus bed, a rhubarb bed, a bed for Jerusalem artichokes (‘sunchokes’), and ramps that I started years ago, near the stream in the woods. I’m an obsessed seed saver…it’s in the blood. LOL Most of my seeds are my own saved seeds but I’m always looking for new open-pollinated/heirloom varieties to try out. I love Baker Creek (rareseeds dot com) and also Amishland Heirlooms (amishlandseeds dot com). I recently discovered Roughwood Seeds via Baker Creek and so I ordered 3 new heirloom varieties to try this Spring. We grow asian greens (choi, tatsoi, mizuna, mustard greens), asparagus (perennial), beans (pole & bush for shell and pod), beets, broccoli, broccoli raab, carrots, cabbages, chards, chinese cabbages, cucumbers, eggplants, lettuces, malabar spinach, melons, onions, peas, peppers (both sweet and mild-hot), potatoes, radishes, raspberries, salsify, squash (both winter and summer types), spinach, strawberries (we perpetuate our berry beds via runner transplants), tomatoes, turnips. Some years, I will grow certain seeds just to revitalize the seed stock on hand, ie onion, beans, etc. Other seeds I will grow simply to grow the seed inventory. This year, I found a chard that will set seed (bolt) in one season. I’m hoping that it’s a productive and tasty variety because it’s always easier to save seed within the growing season as opposed to a 2-year seed process. To test your seed’s germination rate, get 10 seeds of 1 variety and place them on a dampened paper towel on a plate to germinate, then keep them dampened to encourage germination. Once the seeds have germinated, count how many. If 7 out of 10 seeds germinate, you have a 70% germination rate; if 5 out of 10 seeds germinate, you have a 50% germination rate. This doesn’t mean that your seeds are not viable, it just means that you will need to compensate for a lower rate of germination than “fresh seeds” provide. You do not need to “plant” seed to determine if the seed(s) are still worthwhile. If you have an enormous quantity of home-grown seeds and don’t want to waste them (or scatter them), sprout them. Radish, onion, lettuce seeds make some tasty sprouts! I buy my garden veggie seeds from a neighbor who has an organic farm, and get blooming tomatoes mid May because he has 2 greenhouses. The rest of the seeds I gather from wild raspberries, blueberries, gooseberries, June berries, blackberries and wild red cherry trees when I make jams and syrups. I scatter them throughout the forest in natural clearings and to replenish the plants on my property–since I take most of the berries. The rest I grind into flour. The raspberries and blackberries take two years to produce and only produce for two years so they have to be regenerated, and the wild cherry and Juneberries take 4 to 5 years to produce fruit. I transplant two year old trees or blueberry shrubs for better growing conditions. This spring I have to thin out the wild red cherry trees so they have better sunlight, and re-seeding some basswood trees for their seeds, leaves and their honey flavored flowers. It isn’t just growing a garden, it is managing a productive forest. I like Territorial Seeds in Cottage Grove, Oregon. I think it pays to buy seeds from the area of the country you live in. These folks have been supplying the Pacific Northwest for quite a few years. I am not the expert though and others may have good luck from other sources. Burpee seeds, but I go through the seeds sold locally in our nurseries. I look for self pollen, and open pollen seeds. The names of the fruit & vegetables I grew up with, when my dad was growing our family garden. The garden boxes are just the right height and width. Milk crates for our area will work great for squash, and any unwanted critters that can hide in those plants. A friend’s wife picks her squash with a 12 gauge shot gun, their neighbor thought she was nuts until she killed a rattlesnake. And totallytomatoes.com for huge selection of tomato seeds. I didn’t realize how many varieties I grew last year until I started writing it down. I added 6 varieties garlic, 3 more varieties onion, bunching onions, 3 new varieties tomatoes, winter squash, pickling cucumbers, Russian cucumbers, barley, spelt, red wheat, Indian Ricegrass, 2 more varieties potatoes, shallots, edible wild daylilies, Rocky Mountain corn, melons. I ordered a lot of short season seeds because I don’t have many saved. My Texas garden grew about anything! I like Seed Savers, nativeseeds.org, Sustainable Seed Company, and ordered a few things from Nikitovka Seed Co in the Ukraine and Kitazawa seed company from Japan for a couple heirloom stir fry varieties. First try with the last two. Any luck with nikitovka seeds? an interesting radio interview on 120 yr old experiment on how old seeds can be, and still germinate. One hundred thirty seven years ago, MSU botany professor William J. Beal filled 20 bottles with seeds from common plants covered by sandy soil. Then he buried them all in a secret spot on campus. That was the beginning of what would become the world’s longest running scientific experiment. They only dig up one of the bottles every 20 years. if you listen to the radio interview (click on section towards top), towards the end it gets to an interesting comment about a farmer who dug up some farm land (family had been there a lot of yrs), and native plants began to grow from the soil which had been buried ….So those native seeds too survived. I usually buy seeds from walmart or home depot.found out that most were gmo. this year I bought plants from home depot. had sign that they were nongmo. After doing a little research, one will find there is actually quite a difference in GMO and Hybrid seeds probably as much or more difference between Hybrid and Heirloom seeds. GMO seeds or Genetically Modified Organisms are seeds that are literally genetically modified into something that may or may not resemble what the original seed was. Around 80% of the food you purchase at a store is GMO related. Hybrid seeds are usually a cross pollination of two or more different plants, producing a seed that will not produce seeds of the same cross pollination. These seeds are very common but not the favorite of “preppers” as they will not reproduce useable seeds. Heirloom seeds are the cream of the crop so to say. Slightly more temperamental to grow at times, but will “throw” seeds that can be used over and over again, Hence an seemingly endless supply of seeds once you learn to harvest the seeds correctly. Be cautious about planting Hybrid and Heirloom seeds together (same vicinity), the cross pollination could cause problems. Best of luck with the seeds you have chosen (stay away from GMO seeds), and have FUN in the Garden, it’s always a joy for me to work in a place that’s giving so much back. That’s only the case if you want to save seeds. Cross-pollination will not affect this year’s crop. This year I used leftover seeds from years back. green beans & okra. planted last week & already coming up. put some veggie food in with them. so far my garden is doing great. I’ve had watermelon seeds germinate (in spades!) at least fifteen years after they were gathered. I haven’t really tested other things, and unfortunately I can’t be more precise (I know the watermelon was from somewhere in the 80’s or early 90’s, planted in 2010). I thought they were too old so I dumped close to fifty watermelon seeds, thinking one or two might germinate. I don’t know if they all germinated, but I yanked a couple dozen. Those seeds were just kept in a cardboard box, so they were in the dark but by no means a climate controlled area.